A piece of wood can be carved by spinning it on a motorized lathe and holding a sharp chisel to the edge of the wood as it spins. How does the angular velocity of a piece of wood with a radius of 0.2 m spinning on a lathe change when a chisel is held to the wood's edge with a force of 50 N? It increases by 0.1 N•m multiplied by the moment of inertia of the wood. It decreases by 0.1 N•m divided by the moment of inertia of the wood-and-lathe system. It decreases by 0.1 N•m multiplied by the moment of inertia of the wood. It decreases by 0.1 m/s2. This is College Physics Answers with Shaun Dychko. To ask how the angular velocity of something changes is to really ask what is the angular acceleration. So we have a formula here that torque equals moment of inertia multiplied by angular acceleration. We can divide both sides by i to solve for alpha. So we have torque divided by i and the torque is going to be the force multiplied by the distance from the pivot with the axis of rotation. If you look at the piece of wood from the cross-sectional view, the lathe chisel gets placed here and it's scraping against the wood as the wood spins and so it's slowing it down. 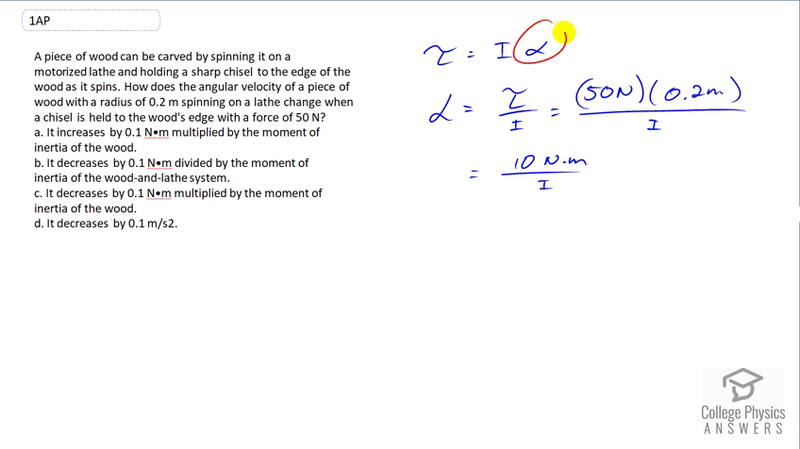 So when we look at these different options here we want to look for one that says the angular velocity is decreasing. That narrows it down to B, C, or D I guess. D we can exclude because the units don't make sense. We're talking about angular velocity here and so units should be radians per second or radians per second squared, so D is not it. For B and C, when we do our algebra here we can see that torque is being divided by moment of inertia and so that excludes C because it says multiplied. So the answer is going to be B although we have a discrepancy between the number here and the number in our calculation. But we're going to have to live with that and just take B anyhow. There seems to be a mistake here with their calculation somehow. But we multiplied 50 Newtons by 0.2 meters to get 10 Newton meters and we have 0.1 here in our answer. But it is the best answer and yeah, we'll take that. Okay, there we go!